I wasn’t really expecting to find anything. I’d just fixed a bug and was doing some testing to make sure everything was working. But an auction came up. It was a ‘lot’ of old Apple II games – original disks! And the bid was still at one dollar. 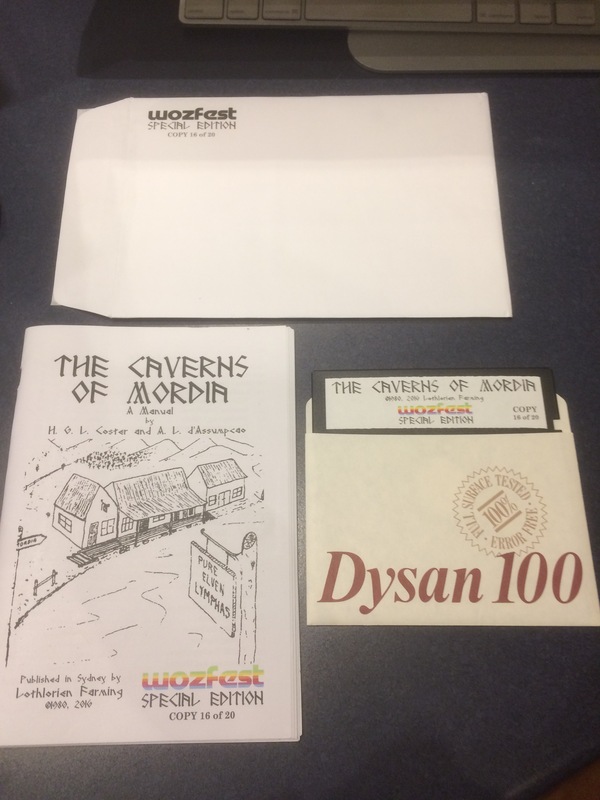 Let’s see – Ultima 1, Cranston Manor, (Sierra) Online systems Hi-res adventures 1-4, stuff from Broderbund, Muse, etc – around 30 games in all – all originals (no boxes or manuals though). Wait a sec, that’s a California Pacific version of Ultima 1. Some quick googling ensues. Yep, these are worth quite a bit of money. And some weird game I’d never heard of called Caverns of Mordia. So I put a bid in and after several days, couldn’t believe my luck. I won the auction for $10.50! The games arrived a week later and I did a closer examination of what I got. All in good order. Yep, this was definitely a bargain. And what on earth is this Caverns of Mordia thing? So I did some searching. I actually found a copy of the disk online in the asimov archive. Downloaded it and played it in an emulator. Real old-school stuff but unfortunately it crashes at certain points – perhaps a bad crack? Did some more searching and found a pdf of the manual. Looked through it and found the authors – H. G. L. Coster and A. L. D’Assumpcao – published in Sydney by Lothlorien Farming copyright 1980. Hm, I wonder who these guys are? Searched for A L D’Assumpcao – no dice. Did a search for H G L Coster and hit pay dirt – found he’s a professor at Sydney Uni and UNSW – one Hans Coster! Could it really be the same person? So I sent him an email. I recently bought a bunch of Apple II games off eBay. Your game, Caverns of Mordia, was included – see attached image. I’m interested in the digital preservation of items such as this and there’s not a lot of information on the internet about it. What I did find was a scan of the manual with your name – and a quick google search later, you were easy to find. I was wondering if I could ask you a few questions about it? And the next day, he replied! What a surprise to r of this; a real blast from the past! I would be pleased to answer any questions you may have. Actually, I still have the source code etc. Wow, I had made contact with an original Apple II game developer. And then I got to meet him! By chance, Wozfest /// (a gathering of Apple II enthusiasts in Sydney) was just around the corner and after some Q&A with Hans, I invited him along and he was very enthusiastic. We had a great time on the night. He brought along some of his original disks, which unfortunately couldn’t be imaged. and some of his notes and graphs he drew up when designing the game. Wozfest $04 came and went and I wasn’t able to go. But unbeknownst to me, the organiser and host of Wozfest, Sean McNamara, planned something a bit more elaborate for Wozfest 5.25” – he hinted at something big in the mailing list. Fortunately I was able to go along to this one. And what a surprise it was – a new updated re-release of Caverns of Mordia! Hans had a slightly updated version of the game which was never released. He deprotected it and had his grandson type up the manual afresh. With Sean’s help they created 20 copies to give away and I was one of those lucky ones to attend in person and receive a copy! Here it is pictured below. For more detailed info about the re-release, follow these links. And that’s how a retro game can come back to life and be preserved. I’m glad I was able to play a small part. If you have any interest in digital preservation, now is the time to act. Read on to Part 2 – a Q&A I did with Hans about the game which contains fascinating historical and technical information.